All the legends leaks and nothing for the foot long line? Baby is disappointed. I'm holding out hope we hear something about a Venom figure. With the movie coming out it would make perfect sense right? 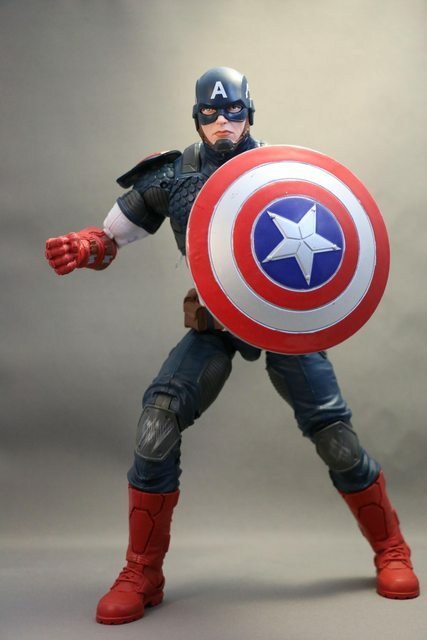 Ordered a Hot Toys Knock Off Captain America Shield off eBay as I just haven't been happy lately with the one that comes with Cap. Looking forward to seeing how that one works with the figure. Also got some Matte Spray and gave Spider-Man a good once over as I felt he was a bit too shiny. And I really like the results. No longer has as many "Hot Spots" from lighting. I imagine a cloth suit wouldn't really be shiny anyways. I may end up trying this with some other figures too. man. i'm hoping we'd get something soon! i'm sure they have to have at least 2 new figures on the way. - anyway, i finally got wolverine from hasbroshop.com! i arrived today. here he is! beautiful thing. uhhh...nothing at ToyFair??? is this line done? Naw man, they just ran out of plastic with all the new legends waves. it's going to be absurd..
Yeah, and a lot of it’s just rebuying better, or two pack versions of characters we already have! Think they really jumped the shark with underwere Deadpool. Remember when we use to get one DP every 10 years? For an actual update on the 12" Legends, I scored Black Panther at Target this morning for $33 + tax. It rang up the normal price but they price matched their own website (I know, it sounds absurd). I also found the X-Force Deadpool at TRU. They had several on the shelves so they must have just put them out last night after closing. Good to know on X Force DP. I’ll be on the look out! I bet so. I just can’t see how they are making bank with all the steep discounting. The price point was just too steep, I think. The figures themselves have all been pretty good but they're too expensive for the kiddie crowd (and super poseability isn't as much of a selling point for a child as sound and play features are) and the adult collector market has better quality figures they could be getting if they felt like shelling out that kind of money. To give you an idea, the Black Panther stuff at my target has been selling like hotcakes the last few weeks, with the only product with absolutely no dent in its supply being the 12 inch Legends, right alongside the other 12 inch figures they haven't been able to get rid of. Not so sure. Nothing was shown for the Infinity War tie-in lines (Basic, Titans, etc. ), but we all know Hasbro's got them coming. They didn't even show the Infinity War Legends that are already leaking into stores. I'm going to go out on a limb and say the next 12in. is going to be MCU: Infinity War-based similar to BP, hence the radio silence at ToyFair. Kids may love sounds and lights but most parents hate them. And parents have all the $$$$$$$$$$. But most parents aren't going to spend $50 when there is a $15-$20 figure available that's basically the same thing. If it's Infinity War, then it will either be Black Widow or Captain Marvel. They're the only two movie characters that would be worth $50. There was a news post on Yakface about Hasbro wanting to decrease the amount of time between toy launches and their respective movies. They were specifically referencing Force Friday but I could see them trying the same thing with Marvel figures. But I think the simpler solution is that the next couple of Legends will be revealed later in the year. 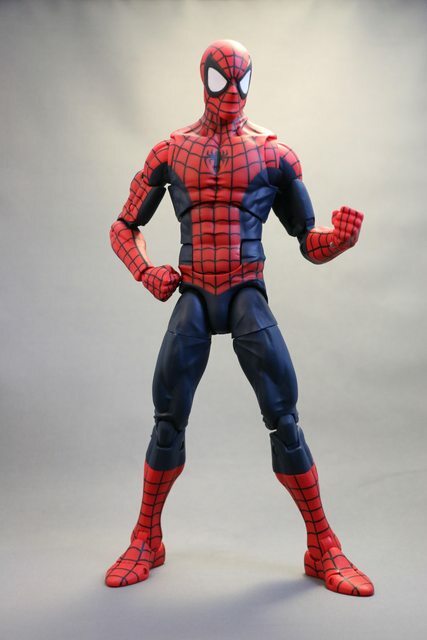 Hasbro only made five 12 inch Legends last year and that's including the Symbiote Spiderman and the SDCC Daredevil. We've already had two releases this year so Hasbro may be waiting until SDCC to show a 12 inch Venom that will be released in time for his own movie. Ordered a 1/6 scale Captain America shield off eBay from China. It was listed as Metal Alloy. Got it in, I'm not sure if it's actually metal. It's kinda heavy but has no magnetic properties which I am bummed about. I was hoping to make it magnetic to Cap's arm and or have little magnet bullet ricochet effects. But it's decent for what I paid for it I guess. It's smaller in diameter then the shield Cap comes with. I think his default shield seems a bit too big. So the smaller size on the new one is welcome. It only had one elastic strap that didn't really work well on Caps forearm so I sculpted some straps on and glued them and it works alright. Still somewhat contemplating ordering another shield from eBay if I can find one affordable enough with a accurate description and photo. And a quick pic of Spidey who has had a nice coat of Matte finish spray that really helps the overall look of the figure in my mind. Hard to tell in photos but he is far less reflective with his paint now and shows alot better for it. I'd say wait for SDCC. If we don't get anything new there, then it's probably safe to assume RIP. Can't see this line continuing myself. They had to have lost a bit of money as most of these sold as discounts. Too bad , personally I love the 12" series. Price kept me away from most of them and I'm currently having to decide between Hulk and Wolvie. Hopefully Hasbro gives this series another wave or two before they pull the plug. Imo the line has just gotten better and better. I too loved the line. I think the Hulk, Wolverine and Deadpool sold really well. Those along with Thor were the most recent releases. So maybe there's that. I think Hasbro is simply going to do repaints for a bit. I can see a Red Hulk and a Grey Hulk coming and another repainted Wolverine. Maximize profits is the name of the game. The Black Panther seemed to be moving pretty decently as well just from my observations. Have the entire set MIB and everytime i look at it i am consumed with regret bc no matter how great they are, i just knew it wasnt going to last. And talk about taking a major loss on ebay. Oy. This and Jada Metals. I am so done with collecting. Just got my Hulk this morning. GameStop had him for $55 so I used my giftcard to purchase him. All I can say is "OMG!!!". I have had a few versions of Hulk from Mego , ToyBiz etc but nothing touches this one at all. Not even close. Maybe I'm easy to please but this might just be a new favorite. Seeing this thing , even in scale pics , does NOT do this figure justice. Until you got it in your hands , you just can't grasp the scope of how massive this figure is and how much it weighs. I'm like a kid at Christmas. Drove myself nuts awaiting this to be delivered all week. Not been that excited to get a new addition to the collection since that 3.75" Bagheaded Spidey was released!